We offer programs specifically designed for our seniors to connect with new people and be part of a community. We are proud to announce that as of January 2019, we offer memberships for seniors whose health insurance includes Silver Sneakers, Renew Active, and AARP Medicare Supplement. These memberships will be available at Downtown YMCA; East Hartford YMCA (not AARP); Farmington Valley YMCA; Glastonbury YMCA; Hale YMCA; Indian Valley YMCA; Wheeler YMCA; and Wilson-Gray YMCA. We are rededicating our focus to our senior community, and expanding our programs and classes as we add new membership types. Below you will find an updated monthly PDF schedule for each branch. 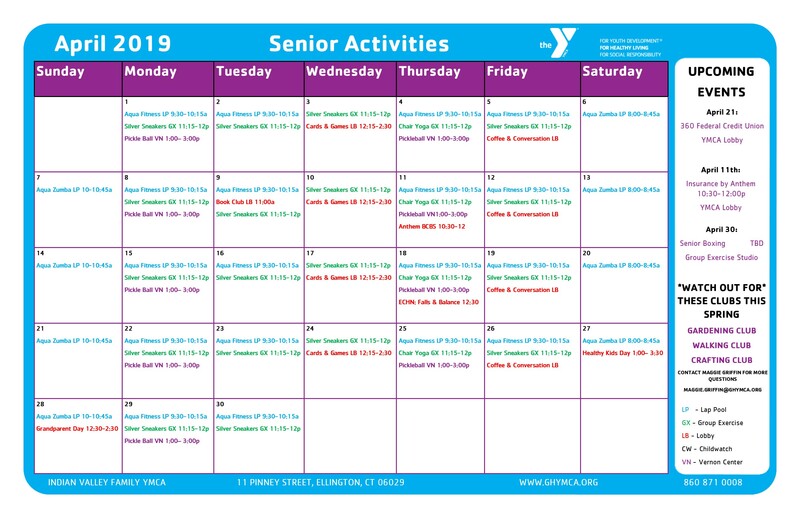 Each schedule includes that branch's senior group exercise classes, swim classes, learning seminars, events and more, all for you to enjoy! In addition, click here for more detailed information on all of our senior fitness classes.